Designing your gardenscape with water conservation in mind can lead to a beautiful, blooming, water-xeric garden. Many parts of the country are experiencing more frequent droughts and hotter weather, resulting in water restrictions. But water conservation doesn't mean that you can't enjoy gardening. This is why we xeriscape! 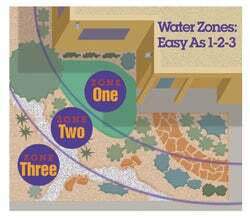 Understanding your landscape's water zones can help you create a water efficient garden. Water use zones allow you to focus water use where it is most beneficial for the beauty of your home's outdoor living environment. The oasis zone, where the more water-intensive plants are used, is the area up close to the house; here the landscape is most visible and accessible to the home's interior and entryways. Use regular moisture and high moisture perennials along with non-xeric groundcovers, ornamental grasses, small ornamental trees, annuals and container gardens. The transition zones, where waterwise perennials are used in areas that occupy the middle ground of the property, especially along walkways, driveways, fences and other areas that are visible as you approach the house. Use waterwise perennials, shrubs,shade trees, ornamental grasses and native turf grass lawns. Harvested water is especially useful for irrigating shade trees, which need infrequent irrigation once established. In higher rainfall areas, plant average water need plants in this zone. Water conservation doesn't mean that you can't enjoy gardening. The xeric zone, where only very xeric plants exist, is the outermost area along the property boundary and other out-of-the way areas that lack supplemental water. Use very waterwise perennials, shrubsand ornamental grasses. Note: Some homeowners opt to forego an oasis zone and bring the transition zone right up to the house. This gives them the look they want while providing additional water savings. ©All articles are copyrighted by High Country Gardens. Republishing an entire High Country Gardens blog post or article is prohibited without permission. Please feel free to share a short excerpt with a link back to the article on social media websites, such as Facebook and Pinterest.